Classically Liberal: October 17, 1989: 5:04 pm - San Francisco. I can tell you precisely where I was on October 17, 1989 at 5:04 in the evening. Unlike thousands I wasn’t at the World Series game not far away. I was at my desk. I had just written a stinging letter of protest to the New York Review of Books. They had trashed a book written by two friends of mine, mainly by distorting beyond recognition, what was said in the book. I don’t remember whether it was the rumbling sound I heard or the shaking that I felt which I noticed first. Perhaps it was both simultaneously. It almost felt like a wave of sound and motion coming at me from the south. As it hit my keyboard started bouncing around on my desk. I desperately tried to press the save commands to preserve my work but the screen turned a deathly black before I could. I was tempted to hang on to my chair but instead jumped up and stood in the doorway lest something fall on me. It seemed to go on for minutes—but it didn’t. It was over in just a few seconds. The only immediate sign that anything had happened was that the lights were still out. I ran to the door and looked up and down the street. All the electricity was out; there were no traffic lights. In their “green” wisdom the city of San Francisco ran their mass transit almost entirely on electricity. In other words, they had built a system that couldn’t operate during an earthquake. Tens of thousands of people were stranded. In minutes many of those thousands came streaming down the sidewalk, a constant flow of humanity trying to get home. Because I was standing there people started asking me if they could use my phone, they offered to pay. I refused such payments figuring it was the least I could do. Throughout the crisis the phones continued to operate, and in 1989 the cell phone was unknown. Soon a line formed inside my office as people waited their turn to check in with loved ones—just wanting the assurance of knowing they were safe. Between callers I used the line to phone a friend in San Diego. He was able to fill me in on the news that I couldn’t get locally. I had learned the magnitude of the quake. It was thought to be 7.0, or 7.1 or 6.9. Any of the options meant it was big—it wasn’t “the big one” but it was big enough. The first thing I noticed was that the shuttle services that took people to the airport and back were running up and down the street giving people free rides. I knew this was quite illegal as the government was anxious to protect their monopoly of “mass transit.” The shuttle services figured that no one would have time to enforce the law and that need surpassed bureaucratic regulations. About the only people who used the crisis for their own ends were the San Francisco police. Within a few minutes of the quake they turned up in the Castro, heart of the gay community, and started ordering the bars to close. Any excuse to harass the gays—that was the motto of the San Francisco police. People coming in the store filled me in on something else that took place. They told me traffic in downtown was flowing relatively smoothly, in spite of all the marooned busses blocking the streets. Apparently the homeless and winos of the city picked themselves up off the sidewalks and doorways where they camped out and started directing traffic. That always amazed me, as they rarely seemed sober enough to find their own way around. Perhaps it was still too early in the day for them to have to have collected enough from panhandling for the rotgut bottles they bought on the cheap. Word started coming in about the real disasters. The first I heard was “the bridge is down.” It was one of the most startling and shocking words I’ve heard. My first thought was that the Golden Gate Bride had collapsed—a truly horrifying idea, not just because of the loss of life it would entail but also because of the loss to the culture and beauty of the city. It was a monument to man, one that deserves to stand for centuries. Instead I soon learned it was the San Francisco Bay Bridge where a section of the upper deck collapsed onto the lower. There were startling videos of a woman driving off the collapsed section. Apparently the government had some employees on the bridge directing traffic. And they were directing traffic into the collapsed area, not away from it. It was the beginning of a string of deaths directly related to state incompetency. In terms of deaths, moving from lower to higher, we would have to go next to the Marina District. This area of the city had been literally created for the Pacific-Panama Exposition of 1915 to celebrate San Francisco’s rise from the ashes of the 1906 quake, which destroyed most of the city. The Exposition was built in an area of marshes and wetlands. San Francisco authorities had used landfill to build extra space for the fair. And when the fair was over they sold the new land to developers for housing projects. Considering that the exposition was built due to the quake of 1906 you would think they would have been reticent about using landfill. Areas of landfill, when shaken violently, have a tendency to liquefy. All stability is lost. The landfill projects of 1915 were homes to thousands of people by 1989 and when the next big quake struck the Marina District liquefied and building after building crashed to the ground; many with their occupants still inside. But still the death toll here was mercifully low—four people. The bulk of the deaths were all on the Cypress Freeway across from San Francisco in Oakland. This was a two-tier highway with an upper and lower deck. The state of California had also built it on landfill and it used designs that were known to the state to be insufficient during an earthquake. For years the government had said they would retrofit the structure but, like government is known to do, they procrastinated. The original architecture of the freeway was asking for trouble and at 5:04 on October 17th, 1989, trouble arrived. Within seconds the upper deck came crashing down on the lower deck taking the lives of 42 people. 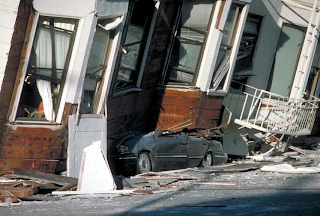 Around the collapsed structure lived some of the poorest people in the Bay Area. There was poverty and there was crime. But that day there was heroism and decency. The people of the neighborhood flocked to the collapsed structure. With makeshift ladders they climbed into the rubble and started rescuing trapped motorists. One by one they pulled people out of the rubble, even though it was well known that a second quake, often a more powerful one, could follow the initial one. Eventually government workers arrived and chased away people. Then the bureaucrats stood their scratching their heads as they decided whether or not to try and rescue people. The poor folk of the neighborhood merely snuck around the structure to the other side, where the bureaucrats couldn’t see them and continued rescuing people. Teams of people with rescue dogs arrived to help only to be rejected by the government emergency workers who argued it wasn’t safe enough to send the dogs in. I clearly remember at one point them announcing that they would conduct no further rescues having determined no one else could have survived. A day later a dehydrated man was pulled still alive from the rubble. He died that day in hospital. Had they not stopped the rescues officially he may well have lived. 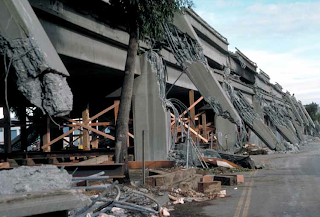 Between the collapsed bridge, the Marina and the Cypress disaster, you have the bulk of the deaths in 1989 quake. All directly related to incompetent government action. Workers on the Bay Bridge directed cars toward the collapse, not away from it. The buildings in the Marina collapsed because the government had filled in wetlands in 1915 and sold that land to developers specifically so they could build housing. And the Cypress collapsed because of the combination of landfill for its foundation and a structure that the government knew was unable to stand a large quake—much as the government knew the dikes around New Orleans could not withstand a major hurricane. I remained in my office for another hour before deciding to lock up and walk home. As I got to the corner one of the few gas busses in operation pulled up. It was jammed with people, as you might expect. The door opened and the bottom step inside was vacant. I hopped on until it reached Castro. Along the way I looked out the door window. From the Marina District I could see the smoke from the fires that had broken out. The fire department simply couldn’t respond that day. All the official reports I read later spoke of the hundreds of citizens who started battling fires before any official help arrived. Throughout the city, the reports later showed, individuals, untrained in rescue work, climbed into buildings and brought out the wounded or helped those just too shaken up to know what to do. The police, who apparently had time to roust gay men from the bars in the Castro, said they were spread too thinly to help the public very much. That help came from the people of the city, not from those who rule them. My apartment was total chaos. The entrance to the apartment was on the second floor, but the apartment was mostly on the third floor. The stairway was up to the flat was cluttered. Dozens of rare movie posters in frames had come crashing down onto the stairs. Glassware was shattered everywhere. Thousands of books from my library were in large heaps on the floor. A terrified cat was huddled in a corner fearful that it would be blamed for the mess. Bits of glass were being found everywhere for weeks afterwards. It was getting dark and there was still no electricity. I had a couple of battery-operated televisions but needed batteries. My flat mate headed to the Walgreens to buy batteries and candles. He told me that when he got there it was pitch dark. The employees were at the door with flashlights. People queued up outside the door and one-by-one told the employees what they needed. The employees would take the flashlights and go inside hunting for what the people needed. Batteries and candles, however, were free. There was no charge at all, just people who lived in the neighborhood helping their neighbors in a time of difficulty. With the batteries I was able to get both televisions working. With the candles we could start cleaning up the mess. One of the news stories that evening was that dozens of restaurants had banded together and opened up serving areas in the city parks. They used charcoal grills and propane stoves to cook. They announced that the lack of electricity meant all their food would go bad. So they decided to cook it all in the parks and give it away to anyone who wanted to eat. There was little in the way of crime during this disaster. People were too busy helping one another. Strangers helped strangers. Accountants climbed into the destroyed homes of the elderly and helped rescue them when the police and fire department couldn’t. The poor in Oakland risked life and limb, and arrest, to pull the living from the rubble of the Cypress Freeway. Up and down the main streets the airport shuttles, in defiance of the law, gave people free rides, just wanting to help people get home to the people they loved. Across the city housewives, students, and others had grabbed hoses to fight the fires that broke out while the city fire fighting system failed for the most part, much as it did in 1906. It was the homeless and the panhandlers who directed traffic that day. Civil society rose to the task that faced it that October day. Government failed. What we got was bureaucratic edicts, which if obeyed, would have cost more lives. The vice president flew into town and got into a catfight with the mayor. They sniped at one another and tried to score political points while people were in mourning for the lives that were lost and trying to rebuild what they could. Say what you will about the people of San Francisco. But when they were needed they rose to the occasion and supported one another. They should uncommon courage and common sense and they were the real heroes that day. Many of them, perhaps most, had faith in big government—and I can’t understand why they still do. But the bureaucrats and politicians failed them, much as they later failed the people of New Orleans. Conservatives like to ridicule “San Francisco liberals” but I hesitate. As much as I oppose the modern liberal agenda, as a distortion of true liberalism, I can’t bring myself to deride the San Francisco liberal. My memory of their heroic deeds that October day are too strongly etched in my mind. I won’t forget the generosity of the stores handing out batteries and candles for free. I can’t ignore the way the restaurants fed people in the parks, or the way the shuttles ferried people back and forth. The image of the homeless and panhandlers in the intersections directing traffic won’t leave me. And the hundreds of people who risked their lives to climb into the rubble of collapsed buildings or the Cypress Freeway must always be remembered. On October 17th, 1989, in the face of a disaster, government failed. The ideology of the people of San Francisco failed. But the people themselves did not fail. They proved to be courageous, caring, compassionate and capable. They were able to do what the political structure they had put their faith in, was unable to do. posted by blog owner at 1/18/2010 12:44:00 PM DiggIt! Reddit Del.icio.us Slashdot It!